So why the 40 year delay? - a question which demands and answer! I second Lord Gill's recommensations, why settle for second best? I realise the whole point of a McKenzie Friend is to help a litigant with court affairs, legal issues etc so a legal background or a 'good brain' would come in handy,but Lord Hamilton's requirements on who qualifies as a McKenzie Friend seem a bit obstructive. Perhaps he plans for an all solicitor line up of McKenzie Friends ? which I'm sure would be as much use as no use. Very good Peter.Very public spirited. Anyone can tell from that letter he doesn't really want to do it. 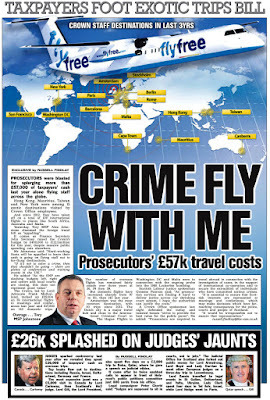 Why all the conditions for Scotland only and why cant he just say "McKenzie Friend" ? I expect the reluctant judge Hamilton is very angry with you Peter. Well done anyway,this lot need a good kick up the backside. Excellent coverage Peter as always and where are our useless newspapers ? All muzzled up by the Law Society I suspect. 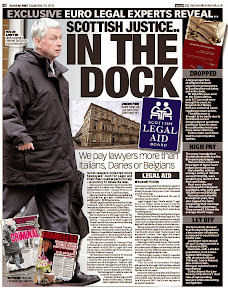 Now people dont need a lawyer to get into court I hope a few more greedy solicitors wind up on the scrapheap! As a friend put it this evening, I think Lord Hamilton is out to ensure no sizeable and knowledgeable cadre of professional McKenzie Friends are able to develop in Scotland. 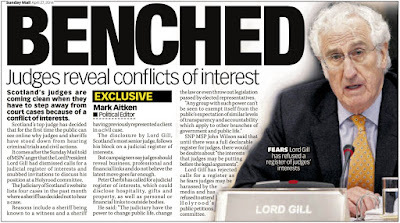 Clearly a deliberate move on the legal establishment's part, and not very much in the spirit of improving access to justice or dealing with Lord Gill's recommendations in the Civil Courts Review. However, at least there are now working dates for the implementation of McKenzie Friends in Scotland and with more discussions due at Holyrood, and hopefully some amendments to the Lord President's [in- parts] somewhat restrictive proposals, I think we can get there in the end. 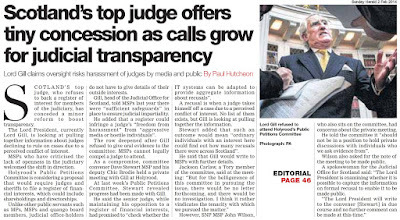 Put it this way, surely we want to see Scottish McKenzie Friends operating with the same rights & professionalism as in many other jurisdictions, rather than being chained to the floor by our judges, for motives which most certainly do not serve the public's wider access to justice. way to go kid ! 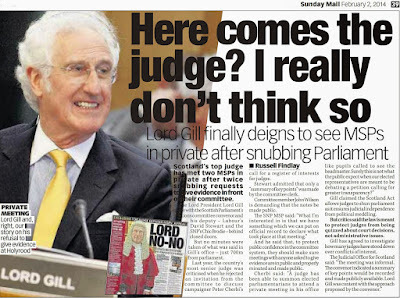 I'm not very impressed with your 'top judge Lord Hamilton' after reading his pathetic letter. 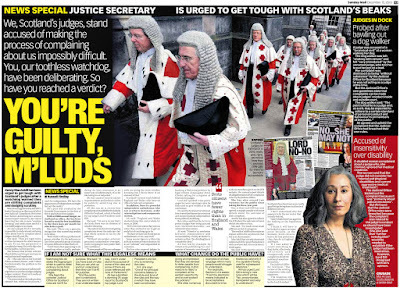 I think Scotland needs a new 'top judge' or probably a whole new judiciary. So what do we learn from this Peter ? 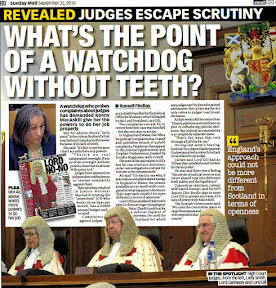 NEVER TRUST A FLAMIN JUDGE ! Obscene restrictions from Lord Hamilton.What is he playing at ? I think you need to work a little bit more on this one Peter because if the judge has his way the only people appearing as Mckenzie Friends will be lawyers ! What a joke.Nowhere does he answer any of the questions put to him by the Petitions Committee previously and we are supposed to accept this ? Get some more headlines Peter! Fools!You will all come running back to lawyers when you need us. I will enjoy making each one of you pay through the nose when that time comes. Clearly Hamiltion is trying to make it as difficult as possible for anyone wanting to use or be a McKenzie Friend.We need the same rules they have in England - much more friendly and useful than Hamilton's dictatorial orders to parly. First Lord Hamilton claims 'oh, we've always had McKenzie Friends here', and now this. 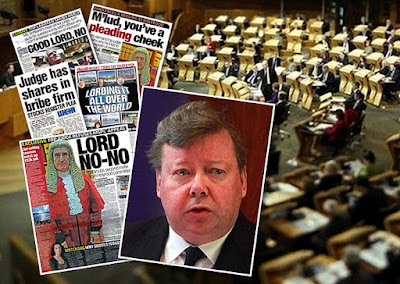 Clearly Lord Hamilton either doesn't know his own subject or has deliberately misled others. Certainly he has questions to answer - just don't expect Nigel Don, John Swinney or any other SNP politician to ask him! What a pathetic attempt to restrict McKenzie Friends by the Lord President. I can assure you Mr Cherbi none of those conditions exist in England.I think you should ask some hard nosed questions of Hamilton & colleagues on this one. Actually some of what the Lord President says is in the English guidance Peter links to but its not as in your face as Hamilton wants to make it. Personally I view Hamilton's letter as being a rather annoying attempt to castrate McKenzie Friends in Scotland before they even being to operate.I'm sure he has it all worked out. Interesting report as always Peter. 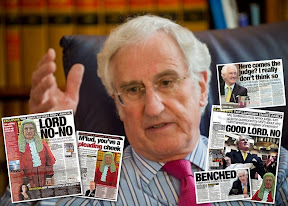 I note Lord Hamilton has finally agreed for the Mckenzie Friend to sit beside the litigant although he leaves open the possibility of sitting behind, for reasons I honestly cant imagine. Who would want to sit behind someone they are in court to assist ? It makes no sense at all. Someone came in today asking how to deal with a crooked lawyer.Recommended your blog to him for some answers. Good one on McKenzie friends.Hope it goes through as intended. It might help if Hamilton issues guidance now to the Courts on how exactly they should treat McKenzie Friend requests.I see however he omitted to say anything about that.Odd. You are doing a superb job Peter, best wishes. 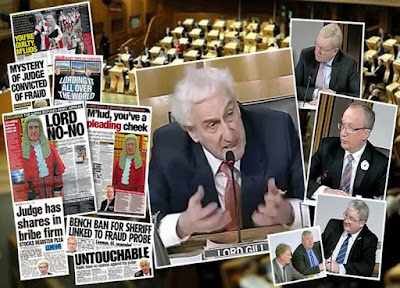 Clearly Lord Hamilton is refusing to reply to questions from the Parliament.He should be made to appear to answer because this is a 40 year obstruction to justice by him and his legal brethren that must be explained. 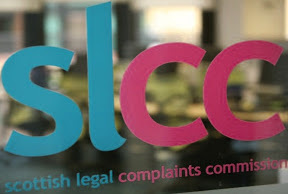 The Scottish government’s flagship reform of the legal profession was in jeopardy last night after a powerful association of solicitors announced that it was seeking to reverse a decision of the Law Society of Scotland (LSS) to support key aspects of the legislation. 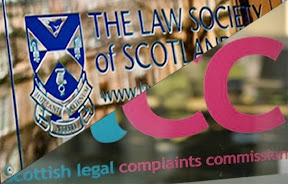 The Scottish Law Agents Society – representing 1,500 solicitors — will this morning “requisition” a meeting of the LSS, and call for a vote on the issue of “external ownership” of law practices by companies such as banks or supermarkets. A controversial LSS vote in 2008 in favour of external ownership – often known as “Tesco law” — has become a key part of the Legal Services (Scotland) Bill, and is set to become law later this year. However, galvanised by the introduction of the Bill in October, which introduced external ownership along with other unpopular reforms known as ABS (Alternative Business Structures) opponents are now confident they have the numbers to overturn the proposed changes. Last night, Ian Smart, the president of the LSS, indicated the society would abide by the decision of the general meeting, which must be held within 28 days of the requisition. “The debate will set the profession and so the society’s policy on external ownership of ABS,” he said. The government’s Bill permits not only “Tesco Law”, but also enables legal firms to raise capital from outside investors and expand their professional services into areas such as accountancy and financial consultancy. The changes were promoted by the action of Which? 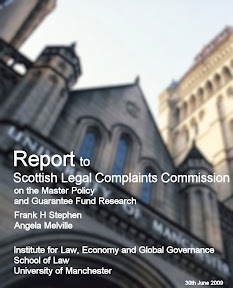 magazine, when in 2007, it submitted a “super-complaint” to the Office of Fair Trading arguing for liberalisation of the Scottish legal services market. You prove one thing, a holder of a law degree and intelligence are mutually exclusive. 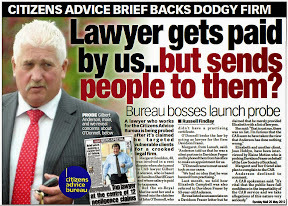 We are paying with our souls now for dealing with your brethern, so why the F**k would we want to go back to a lawyer. You are clearly an idiot, a trait present in all self regulators. Like I said Peter, the old proverb "much rain wears the marble". When is read the response of some lawyers (if they are lawyers) on your blog I think they have low intelligence. Dictators, political or legal only see their ideologies, the way they think things should be. That is why, one cannot reason with a lawyer. This balloon's attitude beggars belief. I would rather stick needles in my eyes that go to a lawyer. 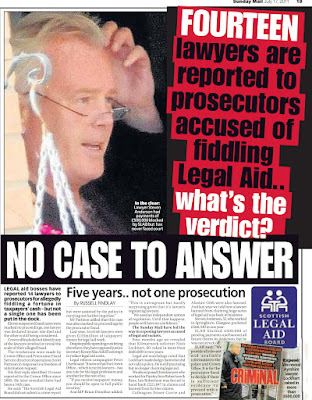 All part of a pre-arranged ploy from the Law Society. 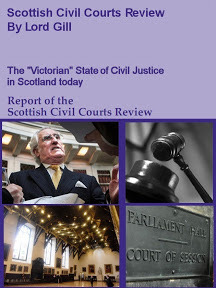 In reality the Law Society of Scotland are very much against the Legal Services Bill (sometimes referred to as Legal Services Bull), and the alternative business structures (by way of allowing non-lawyers to own law firms) the planned legislation promotes. 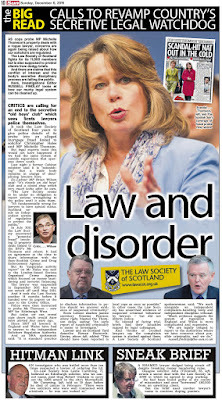 Yes, the Legal Services Bill is a mess, and yes it might fail, but if it does fail I dont see any other legal reforms on the table from Mr MacAskill, and considering no one else "will be allowed to be Justice Secretary" while the SNP are in power (that little snippet actually came from one of their own MSPs) if the Legal Services Bill fails, thats it. 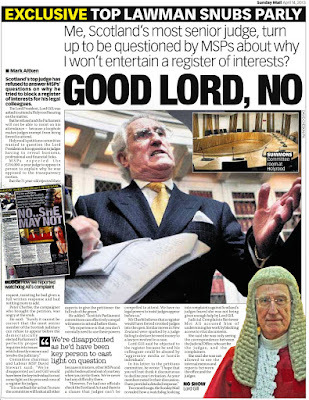 Lord Hamilton should indeed appear before the Petitions Committee for a full questioning on the McKenzie Friend issue. 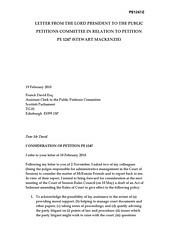 Noting the Lord President failed to answer any of the questions put to him by the Petitions Committee recently, simply issuing his latest letter saying McKenzie Friends will be enacted by June 2010 doesnt really answer why for 40 years, party litigants in Scotland have been excluded from the facility of having a lay assistant the Lord President has always claimed always existed, but in reality has never existed, at least to the degree of any statistics or case examples, which of course Lord Hamilton also seems to be at a loss to mention. For those of you disgusted in the way the judiciary and some of our politicians have handled this matter .. you certainly have a right to be. 40 years of no access to justice, and no explanation or investigation as to why ... well it smacks of corruption & cover up. Hi Peter, Tesco law I cannot wait, then leaflets in their thousands will be distributed in supermarket car parks telling customers to avoid lawyers like the black plague. All the best, brilliant work. Yes, well if it goes through. 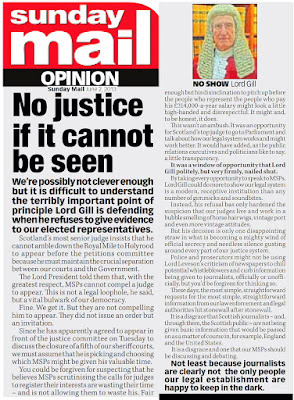 Mike Dailly of the Govan Law Centre is helping to lead the [well planned in advance] charge against the Legal Services Bill .. and with MSPs getting their arms twisted .. maybe even a few sweetners such as free legal advice, the odd mortgage etc ... I wouldn't count on this one going through. Tesco Law might not come yet ... but it should, although in a better format than what is currently on the table from the Scottish Government. Well there's one thing for sure Peter.You seem to know their moves before they make them ! Keep up the good work! I enjoy finding out which lawyers are rats so I can keep away from them. So is Mike Dailly afraid of 'Tesco Law' coming in and ruining the Govan Law Centre's little empire ? Big piece in the Scotsman today about this,makes Hamilton look at right fool. He refuses to give a statement ! 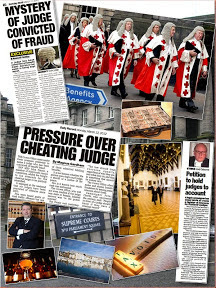 SCOTLAND'S top judge has been accused of putting the Scottish legal system "back into the dark ages" in an escalating row over the help afforded to party litigants in civil court cases. 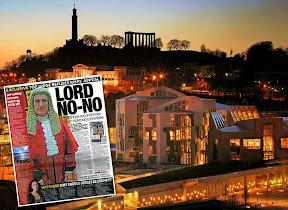 Campaigner Stewart Mackenzie claims Lord Hamilton is obstructing legal reform by placing unreasonable conditions on the use of "McKenzie friends" in Scotland's courts. Mr Mackenzie has lodged a petition in the Scottish parliament calling for the introduction of a system that allows people representing themselves in civil court actions to nominate a lay helper to help them take notes, organise papers or prompt them with questions for witnesses. 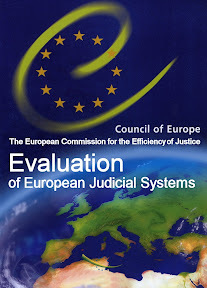 The system, named after a litigant in an 1970 English divorce case, is widely operated in courts in England, Canada and New Zealand, but its official introduction has so far been resisted by the judiciary in Scotland's courts. 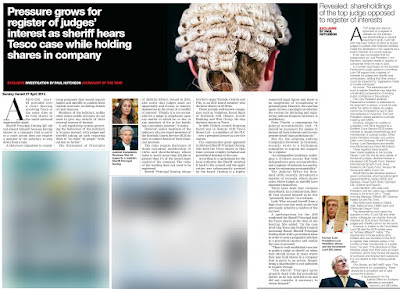 In November, Scotland's most senior judge, Lord Hamilton, wrote to the Scottish Parliament's petitions committee insisting legislation to introduce McKenzie friends was not necessary, as Scottish judges already had the power to allow the use of lay helpers. 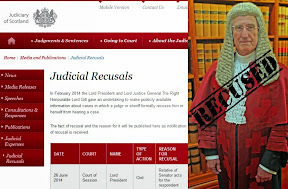 But court officials later denied this was the case, and a letter submitted to the petitions committee this week suggested the Lord President had performed a U-turn, as he indicated the rules in Scottish courts would now be amended to allow McKenzie friends. 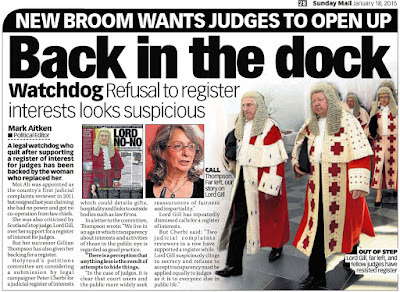 Petitioner Stewart McKenzie, of Perthshire, has now hit out at the judge's proposals, criticising the conditions Lord Hamilton intends to place on the operation of the new system. 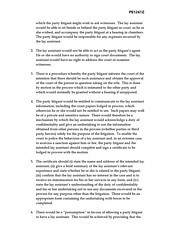 Under the changes to be agreed at the Court of Session Rules Council on 10 May, McKenzie friends will be forced to sign a certificate outlining their "relevant experience" in court as well as declaring whether they are related to the party litigant. 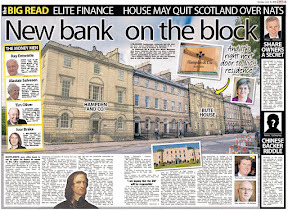 Mr Mackenzie told The Scotsman: "There are a couple of serious issues that mean Lord Hamilton is going to put us back into the dark ages with what he proposes. "A McKenzie friend could be your brother, your sister, your granny, it could be a pal who is a plumber. None of them have relevant experience, so goodness knows where this comes from." He went on: "The other thing he says is a McKenzie friend must state whether he or she is related to the litigant. You might have your brother, your sister, your auntie or your granny helping you. Relationship to the litigant has got nothing to do with it." 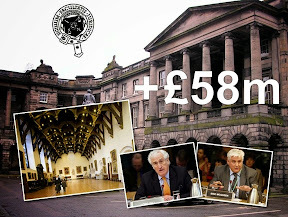 Mr Mackenzie, who has now been asked to provide his reaction to Lord Hamilton's proposals, added: "Scotland has a history of obstructing any changes in law." 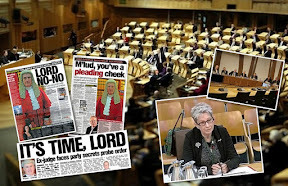 Murdo Fraser MSP, who sits on the petitions committee, said: "It is difficult to see why the court would have an interest in what the experience is of the lay assistant, or whether or not they were related to the litigant. 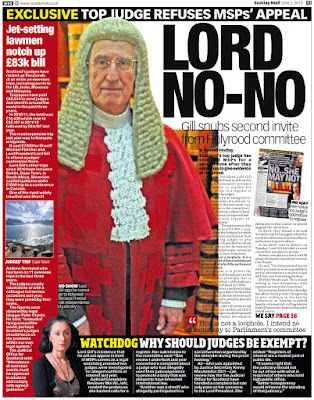 I would want to know what Lord Hamilton's reasoning was for stipulating these particular requirements." A spokesman for the Lord President refused to comment. I think Lord Hamilton has been a bit heavy handed on this one especially considering Scotland has been kept out of the McKenzie Friend issue all these years. I appreciate in his consideration he might want to kill all birds with the one stone,setting strict rules on everything but at least give us a chance to see how they work before hitting them with certificates,misguided seating arrangements and permission to have one or not granted by the sitting judge. A hot topic at work today and also in the hootsmon I see. Well Peter you beat them all to it ! Great work ! Another positive thing to come out of Peter's blog.Fantastic ! 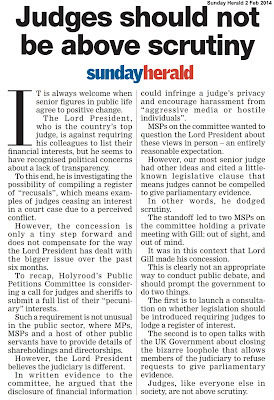 Scotman laying into Top judge Hamilton too. Also good ! 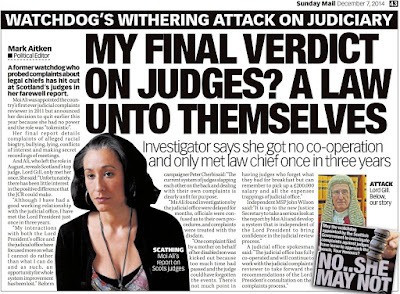 More of the usual then from Scotland's judges who are so obviously out to protect lawyers being able to rip their clients off in court.Disgusting. Hamilton has killed his own credibility after his previous letters to the Parliament which I have read on the link you provided.He should be questioned on why now he is saying he will enact McKenzie Friends in law while in his other letters he claims we always had them. 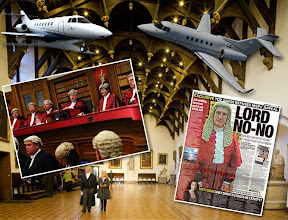 Judge tells a lie to Parliament so what will Parliament do about it ? Cameron Fyfe qualified in 1977 (UNFORTUNATLEY) and was appointed a Partner in Ross Harper in 1981. He specialises in litigation (COVER UPS) and human rights (HUMAN RIGHTS CAMERON, DO NOT MAKE ME LAUGH. IN LITIGATION CASES YOU ATTEMPT TO SUE YOUR OWN INSURERS. 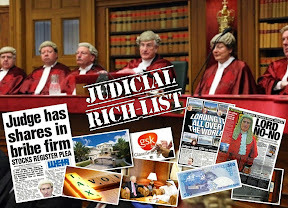 THE EMPLOYERS YOU ARE MEANT TO ACT AGAINST FOR YOUR CLIENTS, ARE INSURED BY MARSH UK ROYAL SUN ALLIANCE. THAT IS WHY YOU COVER UP YOUR CLIENTS OCCUPATIONAL INJURIES BECAUSE YOUR INSURERS UNDER THE LAW SOCIETY MASTER POLICY (YES ROYAL AND SUN ALLIANCE) WOULD BE PAYING YOUR CLIENTS DAMAGES. YOUR DOCTORS YOU SEND CLIENTS TO FOR MEDICAL REPORTS ARE ALSO INSURED BY ROYAL SUN ALLIANCE. and also has an extensive and varied personal injury case load including multi-party actions. 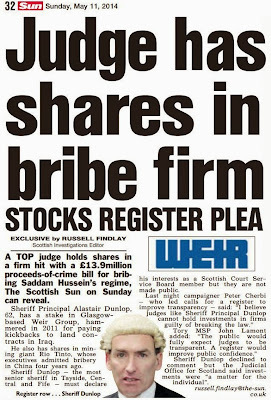 He is one of the best known solicitors in Scotland (I URGE ALL SCOTS TO STAY AWAY FROM THIS CROOK). 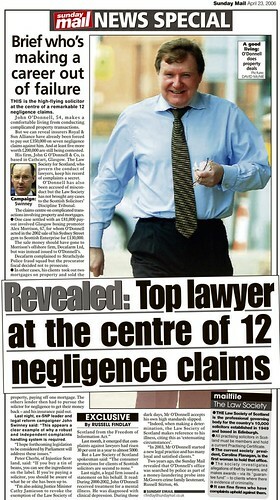 In a recent survey for “The Firm” magazine he was voted the most powerful solicitor in Scotland. (RUTHLESS IS MORE LIKE IT). 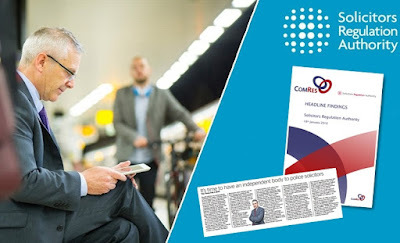 Cameron has a reputation for taking on innovative and often emotive cases that capture the headlines and challenge legal precedent. (HE WILL DO NOTHING FOR CLIENTS WHO DO NOT ATTRACT MEDIA ATTENTION). He acted for a client who received the first successful compensation claim for Human Rights under the European Convention. He has worked on many high profile cases over the years including acting for over 500 clients who are claiming compensation for abuse they allegedly suffered while in schools and homes run by the Catholic Church. 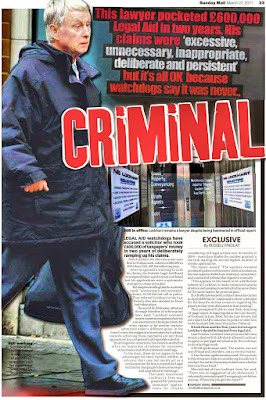 Cameron was also acting for Alfred McTear in his ground-breaking case against Imperial Tobacco. 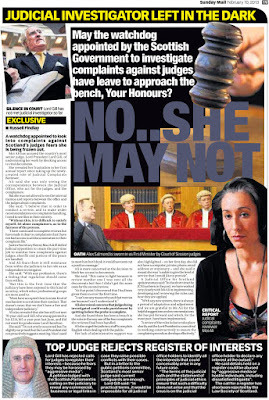 Ultimately the case was unsuccessful but it was as a result of Cameron’s tenacity and his reluctance to abandon the case despite overwhelming pressure, that brought the case to Court in 2006. 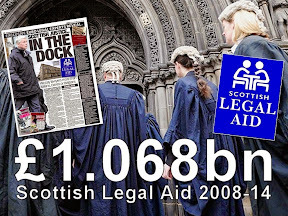 He continues to lead the way in Scotland in many different “class actions”. REMEMBER CAMERON FYFE WILL NOT TELL YOU HE IS INSURED BY THE SAME COMPANY AS YOUR EMPLOYER. EVERY OTHER LAWYER AND EMPLOYER IN SCOTLAND HAS THE SAME INSURANCE ARRANGEMENTS. 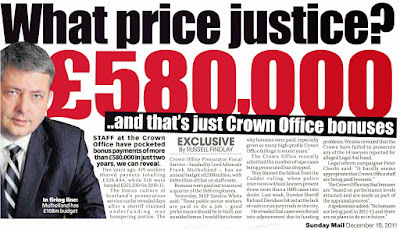 HE IS ACTUALLY GETTING TAXPAYERS MONEY (LEGAL AID TO PROTECT THE LAW SOCIETY OF SCOTLAND'S INSURERS ROYAL SUN ALLIANCE. HE DOES NOT TELL YOU THIS WHEN HE REPRESENTS YOU. 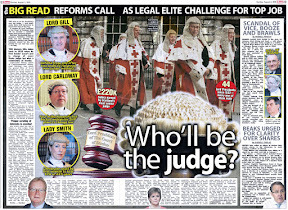 HOW CAN HE BE FIT TO OVERSEE COURT PROCEEDINGS, A MEMBER OF THE PUBLIC LYING WOULD FACE THE FULL RATH OF THE SYSTEM. This happened to a friend of mine, the doctors said there was no medical evidence against my friends employer. It was not Cameron Fyfe that represented him, but I understand now how he never got compensation. 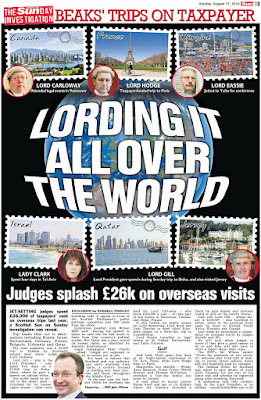 He got a bill for £2000.00 but I think the court quashed it. These cases must all go in the employers favour if the lawyers insurers have to pay the damages. Crooked evil people, and they all self regulate so their is no redress. 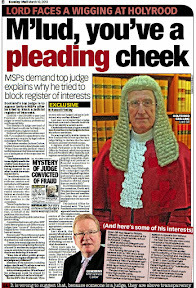 A commendable effort Peter.I hope the McKenzie Friends can help those excluded from the courts to obtain some measure of justice you have campaigned for all this time.Good luck. I must confess a little stupidity at all this as I always assumed McKenzie Friends came from and would be available in Scotland but I see I was very mistaken. Anyway its good to know some people are talking about this and you seem to be getting it after so many years. If you law students are wise you will opt for another degree, because lawyers are the pits. Just like Cameron Fyfe, a man who purports to claim damages for his clients, when he would actually be claiming against the underwriters of the Master Policy. See above, and you will see what I mean. It is shocking to read about people who are meant to be honest legal professionals, who stand for justice. I will never look at a member of the legal profession in the same trusting way again. They are very mendacious. Thanks also to the anonymous tip regarding the law firm & legal aid, which will be investigated. Any more information on that, please post as a comment marked 'not for publication'. I will be reporting on additional developments on the McKenzie Friend issue next week. You do political science very well Peter. I remember one of my lecturers talking about the need to build a strong case and anticipating questions, and providing well prepared answers. He said academics in universities, some do political science, very well, some mediocre and others between these parmeters. He also spoke of NGO pressure groups, doing political science very well, this applies to you, great work, and you are too honest to work at the SLCC as someone joked about earlier. You work from facts, as someone once said "write with a sense of history." All the best. 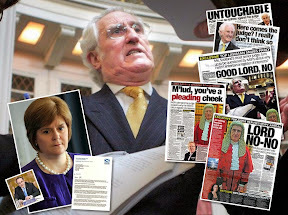 I read through all your coverage of McKenzie Friends for Scotland.Its almost worthy of a movie with all the plot twists ! Pity the newspapers only jumped aboard after you kept on at the judge otherwise it might have been achieved much earlier anyway good work Peter.What a great result. Thanks, and yes its always good to work from facts ...they are certainly in abundance in the debate on regulation of the legal profession and general proposals for legal reform. Yes ... dont think we didn't try last year for media coverage ... but with the Law Society not too keen on the issue appearing in print, well ... it seems no one else was willing to go up against them until now. Yes Peter I agree.Best you stay away from that crooked Stamp Office.The people there are not to be trusted as you well know. Lawyers are vile evil dangerous people. If ever the word scum applied to a profession, lawyers are it. TRUE PETER AND IT IS A GREAT PITY THE PRESS IN MANY INSTANCES ARE CONTROLLED BY THE LEGAL PROFESSION, REMINDS ME OF THE GERMAN PROPAGANDA MACHINE TO SOME EXTENT. There is a lot of misinformation flying around about McKenzie Friends & lay assistance,especially on the point about Sheriff courts where I can tell you from experience anyone other than a lawyer is usually refused permission to speak or just sit there and take notes for an unrepresented party. talked to a friend at the pc - he said they've been told not to call Hamilton in over this ? apparently they are all afraid you are going to u-tube Hamilton again ! Seems you are well known.I just spoke to someone at Glasgow Sheriff Court who told me a few weeks ago McKenzie Friends were not allowed.Now they are!Surprise! 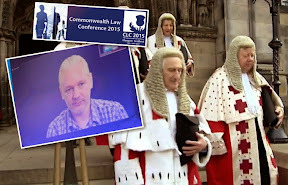 I share your belief there must be an investigation why the proposals for an Act of Sederunt are only now being made after all the fuss of the petition and your reporting.Forty years seems too long just to pass off as 'an ignorance' of a well known facility of assistance in the UK courts system. 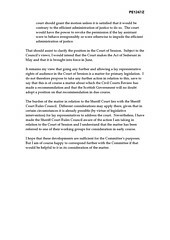 I am not surprised by the judge's tone in his letter.Clearly Hamilton wants to control the court and what better way to do that than restrict right of audience or representation to a lawyers only club.I see from others commenting the politicians already seem to be going weak at the knees so there will be no answers on this 40 year wait.Typical Scotland.It proves yet again to me that anything legal cant be trusted.I'm sure many of your readers feel the same way. "WARNING ABOUT MORTGAGES & WILLS. DO NOT TRUST THE ABOVE ORGANISATIONS OR SCOTTISH LAWYERS. DO YOU WANT YOUR MORTGAGE MONEY STOLEN? DO YOU WANT TO LEAVE YOUR HOME TO YOUR CHILDREN? Glasgow lawyer who covered up husband's £24k client theft gets slap on the wrist by Law Society tribunal, continues working. ITS YOUR MONEY NOT THEIRS". It has the Law Society and Legal Commission signs on it. 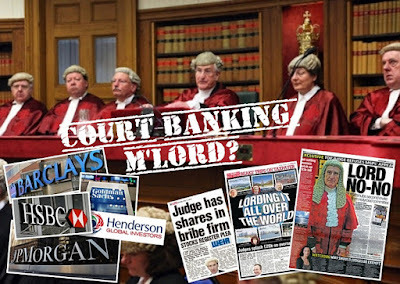 Stealing money and it being covered up, you are right these lawyers are criminals. Oh look ! Here's the latest on the lawyers & rogues who nicked the davinci painting.Anyone want to place bets on who gets let off ? The trial of five men accused of conspiring to extort £4.25m for the return of a Leonardo da Vinci artwork has heard about the day it was stolen. The Madonna with the Yarnwinder was taken from the Duke of Buccleuch's Dumfriesshire estate in August 2003. A court heard how robbers - one of them carrying an axe - threatened to kill a tour guide at Drumlanrig Castle. The men on trial are not accused of the robbery. They deny conspiring to extort £4.25m for the painting's return. Marshall Ronald, 53, Robert Graham, 57, and John Doyle, 61, all from Lancashire, Calum Jones, 45, of Renfrewshire, and David Boyce, 63, of Lanarkshire all deny the charges. Recalling the day of the robbery, tour guide Alison Russell, 25, told the High Court in Edinburgh how two men had come into the castle shortly after opening time. "One of them put his hand over my mouth and asked me to get down on the ground," she said. "He came from behind, put his hand over my mouth and told me I had to lie down on the ground or they would kill me." Sarah Skene, 73, a shop assistant at the castle, described hearing a "commotion". "I went into the Staircase Gallery to see what was happening," she said. "There was a male standing in front of the painting with an axe in his hand. "It was just threatening, I think." The court heard how another man then pulled the painting from the wall and the raiders escaped through a window as alarms sounded. The jury was also shown CCTV images of the two robbery suspects. None of the five men on trial is accused of the robbery. The court case centres on an alleged scam to get members of the Duke of Buccleuch's family and their insurers to pay for the return of the painting. The five men deny conspiring to extort the £4.25m and an alternative charge of attempted extortion. That offence is alleged to have taken place between July and October 2007. The trial before Lady Dorrian continues. IF WE GET OUR WAY THERE WILL BE NO LAWYERS TO GO BACK TO. YOUR SECOND SENTENCE, IS THE NORM, NOT THE EXCEPTION. YOU ARE MUCH MORE INTERESTED MAKING PEOPLE PAY THROUGH THE NOSE THAT LOOKING AFTER THEIR INTERESTS. YOU ARE ALSO A YELLOW BELLIED COWARD BECAUSE YOU DO NOT LEAVE THE NAME OF YOUR LAW FIRM. ALL LAWYERS ARE FILTH. WARNING ABOUT MORTGAGES & WILLS. DO NOT TRUST THE ABOVE ORGANISATIONS OR SCOTTISH LAWYERS. DO YOU WANT YOUR MORTGAGE MONEY STOLEN? DO YOU WANT TO LEAVE YOUR HOME TO YOUR CHILDREN, IN A WILL? DO NOT LEAVE YOUR MONEY WITH ANY LAW FIRM. IN JUNE THIS YEAR MCKENZIE FRIENDS ARE BEING INTRODUCED TO SCOTLAND, ENGLAND HAS HAD THIS FOR 40 YEARS. 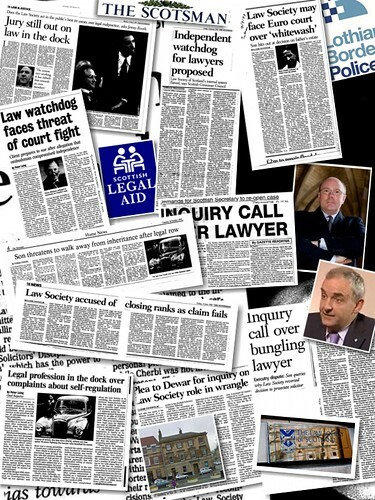 THE LAW SOCIETY HAVE STOPPED THIS FOR 40 YEARS TO PROTECT LAWYERS INCOME. YOU DO NOT HAVE TO PAY EXPENSIVE LAWYER FEES AND SUFFER A COVER UP IF IT GOES WRONG. GO TO COURT YOURSELF WITH A MCKENZIE FRIEND. SAVE YOURSELF A FORTUNE ££££. TRUST NO LAWYER, THEY ARE DANGEROUS. DO NOT BE A VICTIM, OF A LEGAL LOTTERY. WILL YOU BE NEXT? Curiously I see no mention in the BBC article that no fewer than 3 of the accused are lawyers.....how strange. ROSS HARPER ARE SOLICITORS FROM HELL AND THAT IS JUST THEIR LITIGATION DEPARTMENT, WHO ELSE HAVE THEY RUINED. WARNING YOU CANNOT SUE YOUR EMPLOYER IF YOU NEED MEDICAL REPORTS TO STATE YOU HAVE BEEN INJURED AT WORK. HERE IS THE LITIGATION SCAM. IN THE UK ALL LAWYERS, DOCTORS, AND EMPLOYERS ARE INSURED BY MARSH UK ROYAL SUN ALLIANCE. IF YOU GO TO A LAWYER TO SUE YOUR EMPLOYER, YOU WILL GET LEGAL AID. YOUR LAWYER WILL NOT BE WORKING FOR YOU, YOUR GP WILL COVER UP YOUR INJURIES, AND SO WILL ALL CONSULTANTS YOU SEE FOR MEDICAL REPORTS. THIS IS BECAUSE IF THE DOCTORS AND LAWYERS SAID YOUR EMPLOYER INJURED YOU, YOU WOULD BE ENTITLED TO DAMAGES. YOUR DOCTOR AND LAWYERS INSURERS WOULD BE PAYING YOUR DAMAGES, THAT IS WHY YOU WILL SUFFER A COVER UP. THEY DO NOT TELL YOU THIS BECAUSE THEY ARE MAKING MONEY OUT OF YOUR MISERY. 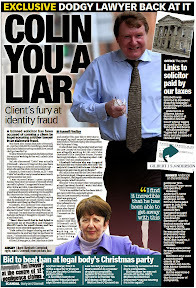 ROSS HARPER SOLICITORS DID THIS TO ME, THEY ARE CORRUPT CROOKS. A court has heard how a gardener ran to challenge raiders making off with a masterpiece from a Scottish castle. John Chrystie, 50, was weeding in the grounds of the Drumlanrig estate when he saw three men with Leonardo da Vinci's the Madonna of the Yarnwinder. He set off after them until one of them produced a small axe to scare him off. Five men are on trial in Edinburgh accused of trying to extort £4.25m for the painting's return. They are not charged with the 2003 robbery. Mr Chrystie, who had worked for the Duke of Buccleuch in south west Scotland for 20 years, said he heard "banging and then alarm bells" on the day of the raid. He told the High Court in Edinburgh he then saw a man wearing a white sombrero-type hat carrying something square. The gardener said that from the colours he recognised it as the Leonardo da Vinci painting. "When I realised what was happening I was going to have a go at one of them and he pulled an axe from his jacket, a small hand axe," he said. "I veered off and just ran up the banking." The jury at the trial has also been hearing a taped recording of a meeting involving the defendants in the extortion case. 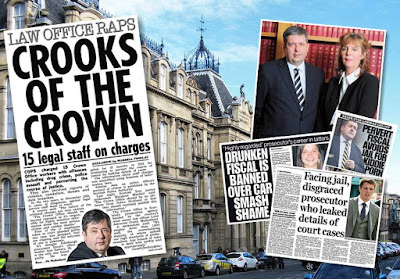 It took place at Glasgow law offices where two of them were solicitors. Prosecutors are presenting it as evidence of a conspiracy to extort £4.25m for the safe return of the stolen painting. Marshall Ronald, 53, Robert Graham, 57, and John Doyle, 61, all from Lancashire, Calum Jones, 45, from Renfrewshire, and David Boyce, 63, from Lanarkshire, deny the charges against them. They pled not guilty to conspiring to extort £4.25m and an alternative charge of attempted extortion. The offence is alleged to have taken place between July and October 2007. The trial, before Lady Dorrian, continues. I can feel Lord Hamilton's bitterness in his letter.He is having none of anybody getting access to court without some high priced legal rat in tow.Sick or what? The arrogance of Lord Hamilton's letter is staggering although I heard yesterday you are causing problems for his plans. Something else was said to be about your blog giving a certain place some ideas after your use of video along with your postings/reporting.